A fire at Beta Theta Pi caused more than $100,000 in damages to one of the fraternity’s two houses late Friday night, according to the Boston Fire Department. 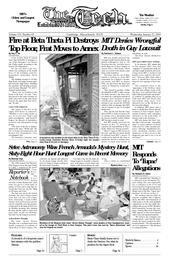 The Guys, who are one of three families seeking to hold MIT responsible for a student’s on-campus death, sued MIT in August 2002, one day before the three-year statute of limitations would have expired. MIT responded last Thursday to a subpoena from Paramount Pictures asking who was responsible for a computer at the Civil and Environmental Engineering headquarters that allegedly distributed an illegal copy of the film “Tupac: Resurrection” at 1:40 a.m. on Dec. 4. Why Don’t Americans Appreciate ‘Football’?